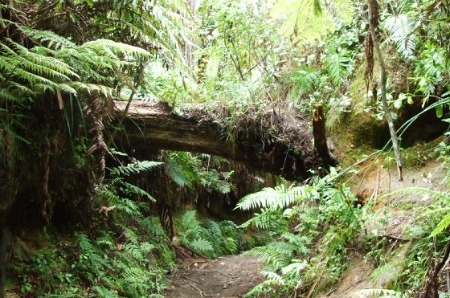 The Rotorua Redwoods is a hugely popular section of the Whakarewarewa Forest. Attracting more and more visitors, it is mostly used for walking and running with seven tracks catering to all fitness levels and ages. It's them we have to thank for the redwoods we have today. 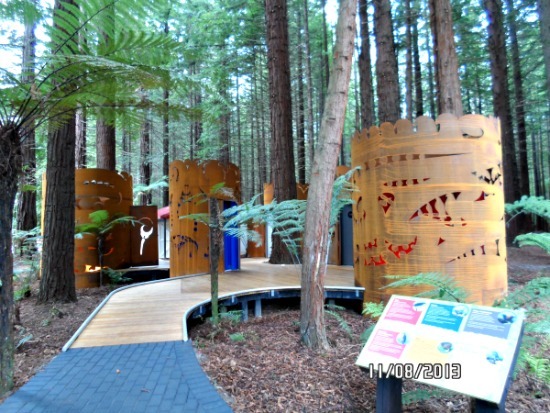 The actual Redwood Grove only covers about 6 hectares (14 acres) of the 5,600 hectares of Whakarewarewa Forest. Some of the tracks expand out into this larger forest where they begin intersecting with mountain bike tracks. Not wanting you to be disappointed, you need to know up front that the forest outside of the Redwoods area is 'european', meaning it's a working forest with trees being harvested periodically. The landscape changes dramatically when that happens. It becomes almost unrecognisable. The tracks are all colour-coded so it's easy to find your way. Mind you, I'm always coming across bewildered looking people who have lost their way. The signage is improving but it takes time. Heck, even I get lost. My daughter and I tried a shortcut recently. Half an hour later we emerged about 2m from where we started. My girl was not impressed. If this happens to you don't be afraid to ask anyone you meet for directions. Everyone is happy to help. Most of the tracks are made up of a mixture of track or forestry roads. On the longer walks one minute you will be on a narrow track, then a road, then criss-crossing all over the place. As you wander, storybook views appear or you may get a whiff of rich, pungent soil - or sulphur. Then again, a good stiff climb will have you breaking free of the trees and having Rotorua spread out in front of you.. magic. Also, check at the info centre to see if any events are due to take place. We have quite a few out there so you may want to adjust your route to suit. For me this would have to be either early morning, as in around 7am or earlier in summer or, late afternoon. At those times I know I have the place mostly to myself. It can get like grand central station out there - well, not quite that bad. Seeing at least ten people while on a walk would seem super busy. 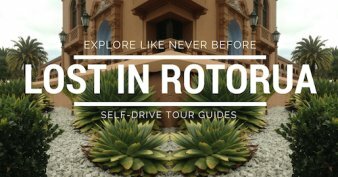 That doesn't include tour groups that go through The Redwood Memorial Grove Track. There's not too many of them thank goodness. This walk is so, so pretty and I think it is the main one that visitors walk. The terrain is undulating but runners still manage to train while pushing prams. The walk is basically set out in a rectangular fashion with what we call a top and bottom track. If you have children with you this is the best track to take them on. My friends and I have had kiddies here over the years and without fail they start saying, "Are we there yet?" - before we're even half-way. If you want to keep them entertained though, pick up a free Junior Explorer Map from the Gift Shop. That will keep them busy. There's a reward at the end if they manage to chase down the clues. This track incorporates most of the Redwood Track but the rectangle is extended further. You will be doing some huffing and puffing on this track with stairs thrown into the mix. Once you get to the topmost part of the track and you're on your way back down, there is a lookout which takes in a panoramic view of Rotorua. It also looks down over the old Quarry. There are some gorgeous bits and it gets very quiet and peaceful with punga's (a fern) and other lovely bush plants. This is a great walk that takes in some varying terrain. In and out through trees, tracks and forestry roads. 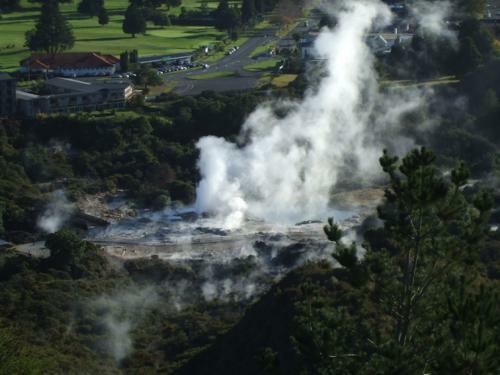 There is a high point with fabulous views over Rotorua and Whakarewarewa (Te Puia and the Pohutu Geyer) as well as the Whaka Village itself. Carry on over the hill and there is a little branch off to the left where you are suddenly looking out over the Waipa Sawmill and hills and more hills covered in radiata pine. During this walk there is a little wooden bridge to cross over once back on flatter ground. Sometimes when we have had enough rain it gets covered in water - enough to go above my knees. It's not running water, just runoff water from the hills so is safe to cross. This one is a bit of a huffer and puffer. It takes me about 40min at a good pace to get to the top with it being mostly uphill. I usually have to work up to tackling this walk so you need a good level of fitness. 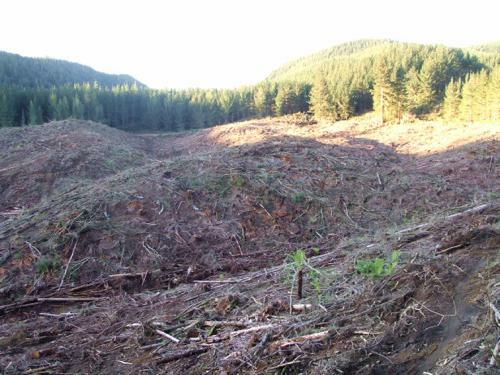 There has been felling going on recently (2011) as I can see it from my place so there will be fabulous views now. I suppose we can't have everything all at once so that's the tradeoff I guess. I haven't completed this circuit although I have done different parts of it at different times. I would tend to think it is quite challenging and only for serious hikers. Silly friends of mine have done it - without training - and ended up crippled for quite a few days afterwards. There are some gorgeous parts to this track. It goes past both the Blue Lake (Tikitapu) and the Green Lake (Rotokakahi) with stunning views if you strike the right time. One minute you're way up high and then down really low. There are a lot of ups and downs with this walk. 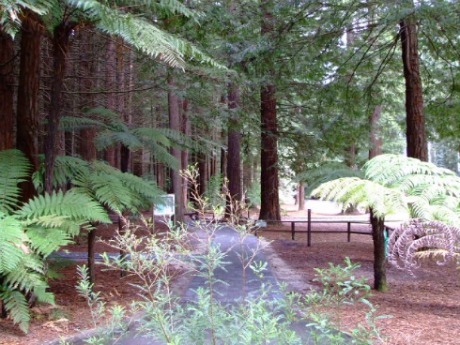 For starters, many people take picnics to the Rotorua Redwoods. A number of picnic tables are located outside the iSite building. Inside, you can purchase coffee, tea, etc., and muffins and other snack foods. There is a good bakery and also a cafe on Tarawera Rd (see the map below). 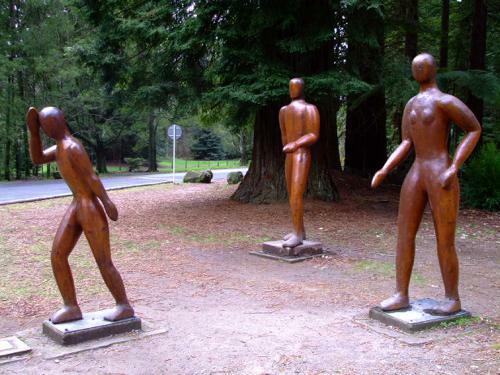 They are located by the major roundabout you would take to get to the forest turnoff. 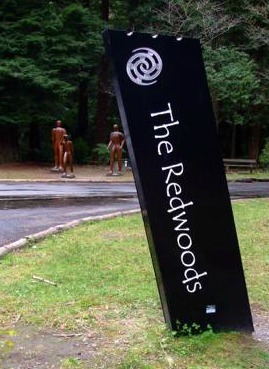 Also located right next to the roundabout is the Redwood Centre, opposite the bakery and cafe. Here you will find Burger Fuel, Best Sushi, a fresh vege shop, Couplands Bakery, Te Arawa Fish & Chips, the Coffee Club cafe, a pharmacy, gym, hairdresser and still a few more shops to fill. 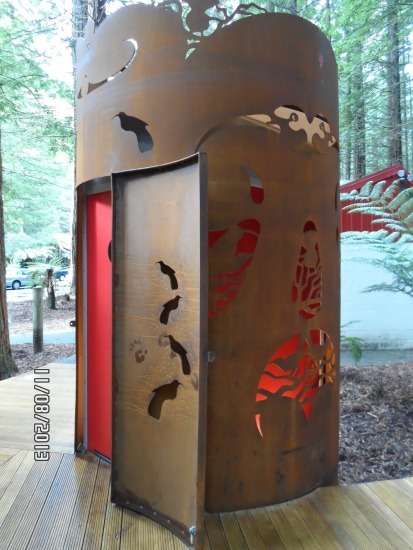 A brand new lot of toilets opened at the Redwoods on August 6th 2013. Different aren't they? 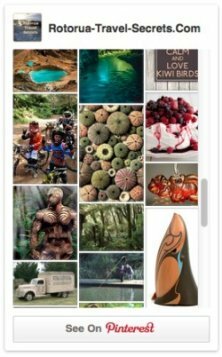 Combining art that features New Zealand's endangered birds gives rise to an educational component that everyone can enjoy. The steel surrounds are weathered to blend into the environment but somehow I don't think you will miss seeing them. Can you pick out the native birds? Where Is The Redwood Forest? 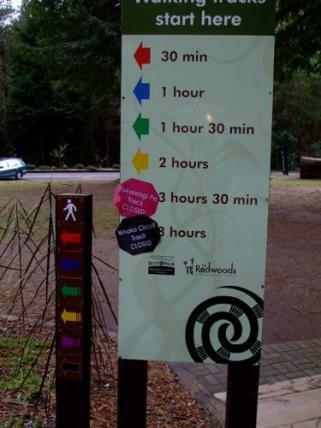 The Rotorua Redwoods are located on Long Mile Rd (see map below) You will see why it's called the Redwoods when you get here. Hard to believe but it's only minutes away from the city center. About half-way down Long Mile Rd there is a carpark on the left. 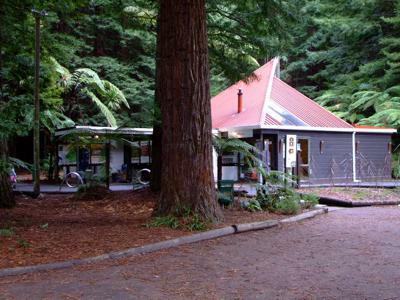 This is where you will find the Redwoods Gift Shop & Visitor Center (info center) and, most important, toilets. This point is where all six of the marked walking/running tracks leave from. The little shop is where you can get all the track information relating to current closures/safety etc. They also sell a comprehensive Recreation Guide (funds raised go towards track maintenance) with info/maps/photos on walking, mountainbiking, and horse trekking. Yes, they all take place here. You might want to buy a Manky (navigational map and hanky combined). They are very cool. There is mountain bike info on one side and walking on the other. Stuff it in your pocket, wipe your face or glasses - handy huh? Use the Manky in combination with the Recreational Guide and you're set. There are orienteering maps which you may want to have a go at too. The maps cater to different levels of expertise. This Google Map shows where the Redwoods are in relation to the city and also Gilles Bakery.